The Reiter family garden, wedged between Stanyan Street, Woodland Avenue and the Sutro Forest, was once a commercial nursery run by Victor Reiter, one of the founders of the California Horticultural Society and San Francisco‘s most famous grower, hybridizer and collector of plants and trees. The garden is still in the family’s hands, with two of Reiter’s children still residing on the west side of Stanyan Street. Reiter was a collector of unusual trees and plants, and many of his specimens are still thriving in the garden. The garden’s Campbell’s magnolia (a wedding present to Victor and his wife Carla from an English well wisher) is now in full bloom. 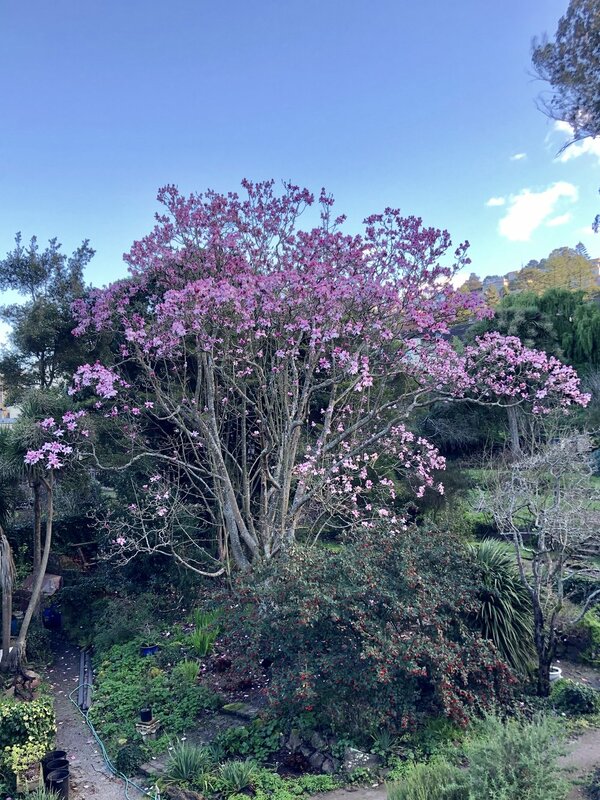 Hoheria, firewheel tree (Stenocarpus sinuatus), lilly pilly (Syzygium smithii) , northern ratas - all trees that are rare or nonexistent on San Francisco’s streets, can still be found in the garden, hints of Victor Reiter’s hand, long after his death in 1986. The garden is private, but you can catch a glimpse from the Sutro Forest trail that starts just a few feet above the corner of 17th and Stanyan streets - the garden is visible on the right after a short walk into the forest.